Century, brevet, cross-state, and ultra distance, there is only one book that covers them all. 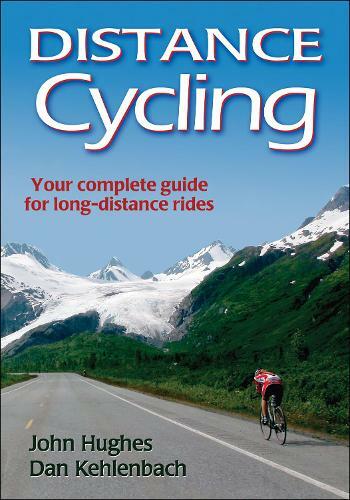 "Distance Cycling" is a comprehensive guide for planning, training and competing in long-distance events. These two great authors team up to cover the sport from every angle. Combining sport science, including the latest research on training and conditioning and with hands-on advice for planning and performance, "Distance Cycling" will ensure you get the most from every ride. "Armed with training programs from John Hughes and Dan Kehlenbach, I became a UMCA champion, solo RAAM qualifier, cross-state record holder, and 1200K finisher. Distance Cycling will give you the advantages these authors gave me." "I wish Distance Cycling had been available 35 years ago when I struggled to find intelligent information about how to ride farther and faster. This book is a must for any rider who wants to improve overall long-distance cycling performance." "Distance Cycling is the coach you've always wanted and needed. John Hughes and Daniel Kehlenbach have taken the best and most current information about training, diet, safety, technique, and mental preparation and applied it to all cyclists yearning to go farther and faster." "With Distance Cycling, Hughes and Kehlenbach have created an important, accessible tool of self-knowledge and empowerment for the motivated endurance cyclist."